As much of a problem as space junk is, building Unicron doesn't seem the best way to handle it. I thought they were working of a laser broom as the first means of performing clean up? You know, bombarding partcles with light ... causing them to tumble and rapidly decelerate .... so on and so forth. Ok, I get that burning up the space debris is far more efficient than trying to salvage it, but why does the Pac-man satellite need to destroy itself too? 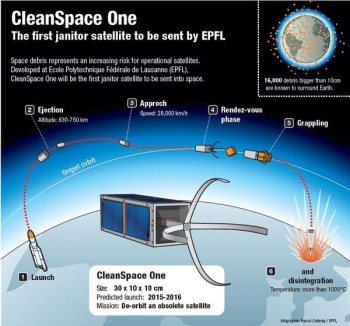 Why couldn't it just collect the debris and then push it in the direction of earth? Already two reference to You Only Live Twice. All these years of smash bros and I never once thought of that kirby move. I am so very ashamed. Using Yoshi to crap out someone as an egg to fall to their doom has always been a garunteed chuckle nonetheless. Ot: What happened to the laser burning solution? It seems like this is a more wasteful and costly idea, but I know little of the costs of building space-lasers so only an assumptiom. Yea, the space laser thing seems like a much better idea. We don't have to continually launch things into orbit and it doesn't destroy itself for every use. 10 million dollars to destroy one piece of space junk? Sounds like a silly cash grab designed as something useful. I mean, it's not like the Swiss have ever been known to resort to unethical practices to obtain large amounts of money. This problem is already way too big for such a stupidly expensive, one-off solution. Lasers would be a much better idea (like was linked in the article). Although I suspect it'll come down to having professional garbage teams going out into space and either destroying or capturing every errant piece of debris (like the anime series Planetes). When your childhood invoolves you watching a monstrous planet chewing a civilization to bits, you have had a gooood childhood.